I used to be the kind of person who could eat (large quantities of) absolutely anything and remain effortlessly slim. Whether it's the waning of my young adult metabolism, or five years doing desk jobs, that ability has been slipping away and there is a softening around my middle which I do not appreciate. And I'm relatively healthy, if not always as active as I could be; I eat a lot of fruit and veg, stick to wholemeal and whole wheat breads, pasta and rice, and don't drink alcohol at home. My weakness is often the biscuits in the office and my dreadful sweet tooth, though I think my gain is largely down to lack of effective exercise. With the exception of the teenage acne which was the bane of my life for many years, I have generally been quite happy with my body; even the areas around my thighs and bum where I store fat have not given me reason to be self conscious. Though somehow, the models I see on every website and even the fashion trends made for those without hips have really started to get me down. Twice lately, I've left changing rooms in shops feeling worse about myself because I've tried on clothes not designed for my body shape. Over the last month of beginning with weights and body weight training, I have discovered the intense satisfaction of becoming stronger. 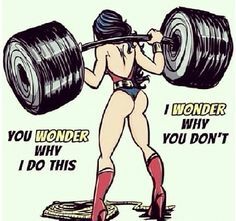 Being a petite woman, strength training was never something I considered, perhaps because it's not marketed to women in the same way as it is to men. Sure, the muscle aches when starting a new routine are a bit troublesome (don't make me laugh, my abs hurt too much), but feeling the growth of muscle on my arms and being able to do a series of push ups is the most reward I've ever seen from exercise. There is something about the strain, the sheer effort invoved, which makes me feel empowered. I've come to realise that while the world may be telling me I need to be slim, I would much rather be strong.